The University of Minnesota is one of the nation's more than 100 land grant colleges and universities with a mission to engage in teaching, research and extension. Through Extension, land grant institutions "extend" their resources to address critical public issues through non-formal, non-credit education. Minnesotans need timely, practical information they can trust. Extension's network of educators and researchers address the most pressing issues facing Minnesota in the areas of environment, food and agriculture, communities, families and youth. Our business is to educate. 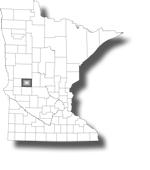 We do that by bringing resources of the University of Minnesota to the people of Douglas County. We deal with concerns of youth, adults and families in their homes, farms, businesses and communities. The University of Minnesota Extension organizes the 4-H/Youth Development Program. If you know of young people interested in joining 4-H or if you would like to be a volunteer leader, please give us a call at (320)762-3890 . Or if you know of anyone interested in the Master Gardener Program, please contact us to get started.